LCD Interface in three languages – English, French, Spanish. K-cup auto-eject & easy to empty bin. Starbucks, Barneys, Green Mountain, Hurricane are among the many brand options available. 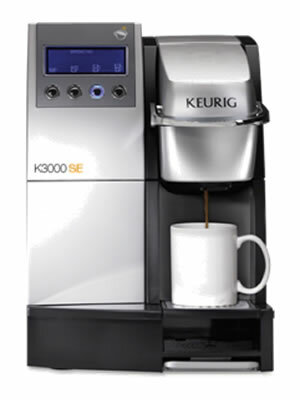 Description: The Keurig B3000SE is the brewer for offices that have heavy kcup usage. Designed for offices of 40 or more employees, this brewer brews fresh, cup after cup in less than 60 seconds. The SE is an upgrade from the previous model boasting better efficiency and a sleeker look. For offices with less than 40, the B150 model is available.